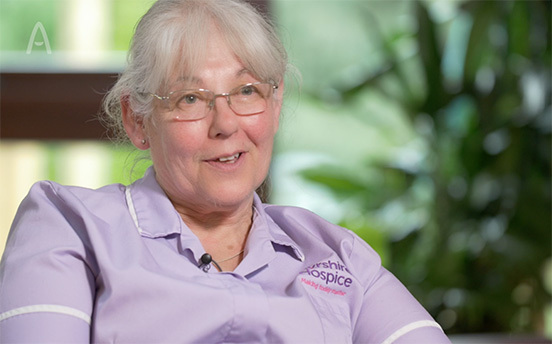 Video to place the Hospice values ‘in the spotlight’ and demonstrate how these values are experienced through the working lives of the staff. To be used as a way to promote the Hospice values to stakeholders and staff at an awards event at Ayr College. This video was shot over one day at the Ayrshire Hospice, The Fundraising Office, Troon shop and the Distribution Centre. Four staff members were interviewed in two different locations. Meanwhile cutaway footage was collected at the four locations allowing TMC to create two separate videos each approximately 4 mins in length. This video, filmed at the Hospice, focused on maintenance and housekeeping staff. With a film crew of two, TMC carried out the interviews and directed the filming of all cutaway shots. Being as we have previously carried out a number of similar film projects for the Hospice, there was little need for client involvement. All footage was shot on 4K cameras whilst the filming of moving vehicles was captured from car to car using a dedicated steady motion gimbal.